Definition at line 51 of file CQLayoutMainWindow.h. Definition at line 64 of file CQLayoutMainWindow.cpp. References backwardAnimation(), CQIconResource::copasi, CQGLViewport::createGraph(), forwardAnimation(), CQIconResource::icon(), mLooping, mpControlWidget, mpFrame, mpGLViewport, mpInfoBox, mpLayout, mpMainBox, mpParaPanel, mpSplitter, mpTimeSlider, mpToolbar, mpValTable, parameterTableValueChanged(), pauseAnimation(), showStep(), startAnimation(), stepBackwardAnimation(), stepForwardAnimation(), and stopAnimation(). Definition at line 411 of file CQLayoutMainWindow.cpp. References CQGLViewport::getPainter(), mpGLViewport, and CQGLNetworkPainter::setItemAnimated(). Referenced by parameterTableValueChanged(), and CQCurrentValueTable::setAllBoxesChecked(). Definition at line 814 of file CQLayoutMainWindow.cpp. References CQGLViewport::getPainter(), CQPlayerControlWidget::isPlaying(), mpControlWidget, mpGLViewport, mpParaPanel, mpTimeSlider, pauseAnimation(), showStep(), CQGLNetworkPainter::showStep(), and startAnimation(). Referenced by CQLayoutMainWindow(), forwardAnimation(), and stopAnimation(). Definition at line 322 of file CQLayoutMainWindow.cpp. Definition at line 316 of file CQLayoutMainWindow.cpp. Definition at line 579 of file CQLayoutMainWindow.cpp. Definition at line 648 of file CQLayoutMainWindow.cpp. Definition at line 686 of file CQLayoutMainWindow.cpp. Definition at line 553 of file CQLayoutMainWindow.cpp. References CQPlayerControlWidget::getBackwardAction(), CQPlayerControlWidget::getPauseAction(), mLooping, and mpControlWidget. Definition at line 795 of file CQLayoutMainWindow.cpp. References backwardAnimation(), CQGLNetworkPainter::getNumberOfSteps(), CQGLViewport::getPainter(), mLooping, mpGLViewport, mpTimeSlider, pauseAnimation(), and showStep(). Definition at line 167 of file CQLayoutMainWindow.cpp. Definition at line 783 of file CQLayoutMainWindow.cpp. Definition at line 245 of file CQLayoutMainWindow.cpp. Referenced by CQGLNetworkPainter::setItemAnimated(), stepBackwardAnimation(), and stepForwardAnimation(). Definition at line 222 of file CQLayoutMainWindow.cpp. References CQGLNetworkPainter::getFontSize(), CQGLViewport::getPainter(), and mpGLViewport. Definition at line 260 of file CQLayoutMainWindow.cpp. References CVisParameters::mMappingMode, mpVisParameters, and CVisParameters::SIZE_DIAMETER_MODE. Referenced by CQGLNetworkPainter::drawGraph(), CQGLNetworkPainter::drawNode(), CQGLNetworkPainter::rescaleDataSets(), CQGLNetworkPainter::showStep(), and CQGLNetworkPainter::zoom(). Definition at line 198 of file CQLayoutMainWindow.cpp. References C_FLOAT64, CVisParameters::mMaxNodeSize, and mpVisParameters. Referenced by CQGLNetworkPainter::createDataSets(), NodeSizePanel::NodeSizePanel(), CQGLNetworkPainter::rescaleDataSets(), setColorMode(), CQGLNetworkPainter::setItemAnimated(), setMaxValue(), setMinAndMaxValue(), setMinValue(), setSizeMode(), CQGLNetworkPainter::showStep(), and CQGLNetworkPainter::zoom(). Definition at line 185 of file CQLayoutMainWindow.cpp. References C_FLOAT64, CVisParameters::mMinNodeSize, and mpVisParameters. Definition at line 250 of file CQLayoutMainWindow.cpp. References CVisParameters::INDIVIDUAL_SCALING, mpVisParameters, and CVisParameters::mScalingMode. Referenced by CQGLNetworkPainter::createDataSets(), CQGLNetworkPainter::setItemAnimated(), and CQGLNetworkPainter::zoom(). Definition at line 227 of file CQLayoutMainWindow.cpp. Definition at line 367 of file CQLayoutMainWindow.cpp. References C_FLOAT64, CQGLNetworkPainter::getNameForNodeKey(), CQGLNetworkPainter::getNodeNameEntry(), CDataEntity::getNumberOfElements(), CDataEntity::getOrigValueForSpecies(), CQGLViewport::getPainter(), mpGLViewport, mpValTable, parameterTableValueChanged(), CQCurrentValueTable::setNumCols(), CQCurrentValueTable::setNumRows(), and CQCurrentValueTable::setRowInTable(). Definition at line 329 of file CQLayoutMainWindow.cpp. References CQGLNetworkPainter::createDataSets(), CQGLNetworkPainter::getNumberOfSteps(), CQGLViewport::getPainter(), CQGLNetworkPainter::isCircleMode(), mDataPresent, mpControlWidget, mpGLViewport, mpParaPanel, mpTimeSlider, CQPlayerControlWidget::setCurrentStep(), CQPlayerControlWidget::setNumSteps(), and showStep(). Referenced by setLayout(), and startAnimation(). Definition at line 270 of file CQLayoutMainWindow.cpp. References CQGLViewport::createGraph(), CCopasiRootContainer::getDatamodelList(), mpGLViewport, mpSplitter, and CCopasiVector< T >::size(). Definition at line 296 of file CQLayoutMainWindow.cpp. References CQGLNetworkPainter::getNumberOfSteps(), CQGLViewport::getPainter(), CQGLNetworkPainter::mapLabelsToCircles(), mpGLViewport, mpTimeSlider, and showStep(). Definition at line 307 of file CQLayoutMainWindow.cpp. References CQGLViewport::getPainter(), CQGLNetworkPainter::mapLabelsToRectangles(), and mpGLViewport. Definition at line 722 of file CQLayoutMainWindow.cpp. Definition at line 146 of file CQLayoutMainWindow.cpp. References addItemInAnimation(), CQCurrentValueTable::getKeyForRow(), CQCurrentValueTable::getValueForRow(), CQGLViewport::isCircleMode(), mpGLViewport, mpValTable, removeItemInAnimation(), and CQGLViewport::updateWidget(). Referenced by CQLayoutMainWindow(), insertValueTable(), and updateValueTable(). Definition at line 543 of file CQLayoutMainWindow.cpp. References CQGLViewport::getPainter(), CVisParameters::mAnimationRunning, mpGLViewport, mpParaPanel, mpTimeSlider, mpVisParameters, and CQGLNetworkPainter::pauseAnimation(). Referenced by backwardAnimation(), CQLayoutMainWindow(), forwardAnimation(), stepBackwardAnimation(), and stepForwardAnimation(). Definition at line 417 of file CQLayoutMainWindow.cpp. Definition at line 450 of file CQLayoutMainWindow.cpp. References CQScreenshotOptionsDialog::ALL_FRAMES, CQGLNetworkPainter::export_bitmap(), CQGLNetworkPainter::getCurrentPositionX(), CQGLNetworkPainter::getCurrentPositionY(), CQGLNetworkPainter::getCurrentStep(), CQScreenshotOptionsDialog::getFrameOption(), CQScreenshotOptionsDialog::getFrameSet(), CQGLNetworkPainter::getGraphMax(), CQGLNetworkPainter::getGraphMin(), CQScreenshotOptionsDialog::getHeight(), CQScreenshotOptionsDialog::getImageHeight(), CQScreenshotOptionsDialog::getImageWidth(), CQGLNetworkPainter::getNumberOfSteps(), CQGLViewport::getPainter(), CopasiFileDialog::getSaveFileName(), CQScreenshotOptionsDialog::getWidth(), CLPoint::getX(), CQScreenshotOptionsDialog::getX(), CLPoint::getY(), CQScreenshotOptionsDialog::getY(), CQGLNetworkPainter::getZoomFactor(), mpGLViewport, CQScreenshotOptionsDialog::USER_DEFINED_FRAMES, and CQMessageBox::warning(). Definition at line 177 of file CQLayoutMainWindow.cpp. Definition at line 607 of file CQLayoutMainWindow.cpp. References CVisParameters::COLOR_MODE, getMaxNodeSize(), getMinNodeSize(), CQGLViewport::getPainter(), CVisParameters::mMappingMode, mpGLViewport, mpTimeSlider, mpVisParameters, CVisParameters::mScalingMode, CQGLNetworkPainter::rescaleDataSetsWithNewMinMax(), and showStep(). Definition at line 643 of file CQLayoutMainWindow.cpp. References CQGLViewport::getPainter(), mpGLViewport, and CQGLNetworkPainter::setFontSizeForLabels(). Definition at line 592 of file CQLayoutMainWindow.cpp. References CQGLViewport::getPainter(), CVisParameters::GLOBAL_SCALING, mpGLViewport, mpTimeSlider, mpVisParameters, CVisParameters::mScalingMode, CQGLNetworkPainter::rescaleDataSets(), CQGLNetworkPainter::setScaleMode(), and showStep(). Definition at line 584 of file CQLayoutMainWindow.cpp. References CQGLViewport::getPainter(), CVisParameters::INDIVIDUAL_SCALING, mpGLViewport, mpTimeSlider, mpVisParameters, CVisParameters::mScalingMode, CQGLNetworkPainter::rescaleDataSets(), CQGLNetworkPainter::setScaleMode(), and showStep(). Definition at line 768 of file CQLayoutMainWindow.cpp. References CQGLViewport::createGraph(), loadData(), mpGLViewport, and mpLayout. Referenced by CQNewMainWindow::switchMode(), and CQNewMainWindow::updateRenderer(). Definition at line 216 of file CQLayoutMainWindow.cpp. Referenced by setMaxValue(), setMinAndMaxValue(), and CQGLNetworkPainter::zoom(). Definition at line 628 of file CQLayoutMainWindow.cpp. References getMaxNodeSize(), getMinNodeSize(), CQGLViewport::getPainter(), mpGLViewport, mpTimeSlider, mpVisParameters, CVisParameters::mScalingMode, CQGLNetworkPainter::rescaleDataSetsWithNewMinMax(), setMaxNodeSize(), and showStep(). Definition at line 635 of file CQLayoutMainWindow.cpp. References getMaxNodeSize(), getMinNodeSize(), CQGLViewport::getPainter(), mpGLViewport, mpTimeSlider, mpVisParameters, CVisParameters::mScalingMode, CQGLNetworkPainter::rescaleDataSetsWithNewMinMax(), setMaxNodeSize(), setMinNodeSize(), and showStep(). Definition at line 210 of file CQLayoutMainWindow.cpp. Referenced by setMinAndMaxValue(), setMinValue(), and CQGLNetworkPainter::zoom(). Definition at line 620 of file CQLayoutMainWindow.cpp. References getMaxNodeSize(), getMinNodeSize(), CQGLViewport::getPainter(), mpGLViewport, mpTimeSlider, mpVisParameters, CVisParameters::mScalingMode, CQGLNetworkPainter::rescaleDataSetsWithNewMinMax(), setMinNodeSize(), and showStep(). Definition at line 600 of file CQLayoutMainWindow.cpp. References getMaxNodeSize(), getMinNodeSize(), CQGLViewport::getPainter(), CVisParameters::mMappingMode, mpGLViewport, mpTimeSlider, mpVisParameters, CVisParameters::mScalingMode, CQGLNetworkPainter::rescaleDataSetsWithNewMinMax(), showStep(), and CVisParameters::SIZE_DIAMETER_MODE. Definition at line 237 of file CQLayoutMainWindow.cpp. Definition at line 614 of file CQLayoutMainWindow.cpp. Definition at line 759 of file CQLayoutMainWindow.cpp. Referenced by CQNewMainWindow::slotFitToScreen(), CQNewMainWindow::slotZoomChanged(), and CQNewMainWindow::slotZoomMenuItemActivated(). Definition at line 754 of file CQLayoutMainWindow.cpp. Definition at line 422 of file CQLayoutMainWindow.cpp. Definition at line 565 of file CQLayoutMainWindow.cpp. References CQGLNetworkPainter::getDataSetAt(), CQGLViewport::getPainter(), mpControlWidget, mpGLViewport, mpParaPanel, CQPlayerControlWidget::setCurrentStep(), CQGLNetworkPainter::showStep(), and updateValueTable(). Referenced by backwardAnimation(), CQLayoutMainWindow(), forwardAnimation(), loadData(), mapLabelsToCircles(), setColorMode(), setGlobalScaling(), setIndividualScaling(), setMaxValue(), setMinAndMaxValue(), setMinValue(), setSizeMode(), stepBackwardAnimation(), and stepForwardAnimation(). Make the layout fit the screen. Make the layout fit the screen. Return the new zoom factor. Definition at line 743 of file CQLayoutMainWindow.cpp. Definition at line 906 of file CQLayoutMainWindow.cpp. Definition at line 866 of file CQLayoutMainWindow.cpp. References mpInfoBox, mpParaPanel, and mpValueTableAction. Definition at line 901 of file CQLayoutMainWindow.cpp. Definition at line 749 of file CQLayoutMainWindow.cpp. Definition at line 896 of file CQLayoutMainWindow.cpp. Definition at line 881 of file CQLayoutMainWindow.cpp. References mpInfoBox, mpParameterTableAction, and mpValTable. Definition at line 427 of file CQLayoutMainWindow.cpp. References CQGLNetworkPainter::getNumberOfSteps(), CQGLViewport::getPainter(), loadData(), CVisParameters::mAnimationRunning, mDataPresent, mpControlWidget, mpGLViewport, mpParaPanel, mpTimeSlider, mpVisParameters, CQGLNetworkPainter::runAnimation(), CQPlayerControlWidget::setNumSteps(), and CQMessageBox::warning(). Referenced by backwardAnimation(), CQLayoutMainWindow(), and showAnimation(). Definition at line 849 of file CQLayoutMainWindow.cpp. References getCurrentStep(), mpTimeSlider, pauseAnimation(), and showStep(). Definition at line 831 of file CQLayoutMainWindow.cpp. References getCurrentStep(), CQGLNetworkPainter::getNumberOfSteps(), CQGLViewport::getPainter(), mpGLViewport, mpTimeSlider, pauseAnimation(), and showStep(). Definition at line 788 of file CQLayoutMainWindow.cpp. Definition at line 387 of file CQLayoutMainWindow.cpp. References C_FLOAT64, CQGLNetworkPainter::getNameForNodeKey(), CQGLNetworkPainter::getNodeNameEntry(), CDataEntity::getOrigValueForSpecies(), CQGLViewport::getPainter(), mpGLViewport, mpValTable, CQCurrentValueTable::numRows(), parameterTableValueChanged(), and CQCurrentValueTable::updateRowInTable(). Definition at line 169 of file CQLayoutMainWindow.h. Definition at line 168 of file CQLayoutMainWindow.h. Referenced by loadData(), and startAnimation(). Definition at line 172 of file CQLayoutMainWindow.h. Referenced by CQLayoutMainWindow(), endOfAnimationReached(), forwardAnimation(), and slotLoopActivated(). Definition at line 150 of file CQLayoutMainWindow.h. Definition at line 148 of file CQLayoutMainWindow.h. Definition at line 166 of file CQLayoutMainWindow.h. Referenced by backwardAnimation(), CQLayoutMainWindow(), endOfAnimationReached(), getControlWidget(), loadData(), showStep(), and startAnimation(). Definition at line 146 of file CQLayoutMainWindow.h. Definition at line 139 of file CQLayoutMainWindow.h. Definition at line 162 of file CQLayoutMainWindow.h. Referenced by CQLayoutMainWindow(), and slotPlayerControlToggled(). Definition at line 159 of file CQLayoutMainWindow.h. Referenced by addItemInAnimation(), backwardAnimation(), CQLayoutMainWindow(), forwardAnimation(), getFontSize(), insertValueTable(), loadData(), loadSBMLFile(), mapLabelsToCircles(), mapLabelsToRectangles(), parameterTableValueChanged(), pauseAnimation(), removeItemInAnimation(), saveImage(), setColorMode(), setFontSizeForLabels(), setGlobalScaling(), setIndividualScaling(), setLayout(), setMaxValue(), setMinAndMaxValue(), setMinValue(), setSizeMode(), setZoomFactor(), showStep(), slotFitToScreen(), slotResetView(), startAnimation(), stepForwardAnimation(), and updateValueTable(). Definition at line 164 of file CQLayoutMainWindow.h. Referenced by CQLayoutMainWindow(), slotParameterTableToggled(), and slotValueTableToggled(). Definition at line 141 of file CQLayoutMainWindow.h. Definition at line 177 of file CQLayoutMainWindow.h. Referenced by CQLayoutMainWindow(), and setLayout(). Definition at line 153 of file CQLayoutMainWindow.h. Definition at line 173 of file CQLayoutMainWindow.h. Definition at line 157 of file CQLayoutMainWindow.h. Definition at line 151 of file CQLayoutMainWindow.h. Definition at line 147 of file CQLayoutMainWindow.h. Definition at line 140 of file CQLayoutMainWindow.h. Definition at line 175 of file CQLayoutMainWindow.h. Definition at line 155 of file CQLayoutMainWindow.h. Referenced by backwardAnimation(), CQLayoutMainWindow(), loadData(), pauseAnimation(), showStep(), slotParameterTableToggled(), and startAnimation(). Definition at line 144 of file CQLayoutMainWindow.h. Definition at line 149 of file CQLayoutMainWindow.h. Definition at line 152 of file CQLayoutMainWindow.h. Definition at line 158 of file CQLayoutMainWindow.h. Referenced by CQLayoutMainWindow(), and loadSBMLFile(). Definition at line 160 of file CQLayoutMainWindow.h. Referenced by backwardAnimation(), changeStepValue(), CQLayoutMainWindow(), forwardAnimation(), getCurrentStep(), loadData(), mapLabelsToCircles(), pauseAnimation(), setColorMode(), setGlobalScaling(), setIndividualScaling(), setMaxValue(), setMinAndMaxValue(), setMinValue(), setSizeMode(), setValueOnSlider(), startAnimation(), stepBackwardAnimation(), and stepForwardAnimation(). Definition at line 170 of file CQLayoutMainWindow.h. Referenced by CQLayoutMainWindow(), and slotToolbarToggled(). Definition at line 156 of file CQLayoutMainWindow.h. Referenced by CQLayoutMainWindow(), insertValueTable(), parameterTableValueChanged(), slotValueTableToggled(), and updateValueTable(). Definition at line 174 of file CQLayoutMainWindow.h. Definition at line 142 of file CQLayoutMainWindow.h. Definition at line 138 of file CQLayoutMainWindow.h. 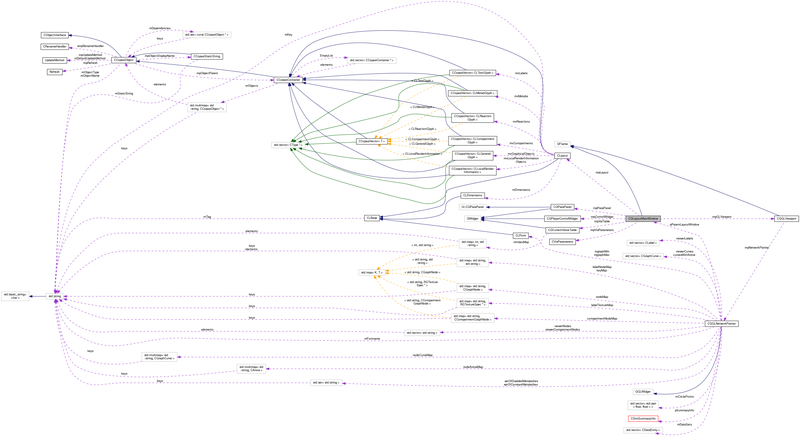 Referenced by getAnimationRunning(), getMappingMode(), getMaxNodeSize(), getMinNodeSize(), getScalingMode(), getStepsPerSecond(), pauseAnimation(), setAnimationRunning(), setColorMode(), setGlobalScaling(), setIndividualScaling(), setMaxNodeSize(), setMaxValue(), setMinAndMaxValue(), setMinNodeSize(), setMinValue(), setSizeMode(), setStepsPerSecond(), and startAnimation(). Definition at line 176 of file CQLayoutMainWindow.h. Definition at line 171 of file CQLayoutMainWindow.h. Definition at line 143 of file CQLayoutMainWindow.h. Definition at line 86 of file CQLayoutMainWindow.h. Definition at line 87 of file CQLayoutMainWindow.h.